In "Pentagon Jihadis," I listed eight American soldiers and sailors associated with jihad against the United States. As their numbers continue to grow, here is an additional listing of jihadis as they appear. Ryan G. Anderson, also known as Amir Abdul Rashid, was charged today with three counts of helping Al-Qaeda, as an unnamed federal law enforcement official explained, "by wrongfully attempting to communicate and give intelligence" to it. (February 12, 2004) May 13, 2004 update: In an undercover tape shown at his Article 32 hearing (comparable to a grand jury in the civilian legal system), reports the Seattle Post-Intelligencer, "Anderson gives Jordanian ancestry on his mother's side of the family as a motivation for defecting, claiming he was sickened when fellow soldiers denigrated Arabs and Muslims without reprimand." Sep. 3, 2004 update: Anderson was convicted of trying to aid Al-Qaeda and sentenced to life in prison. 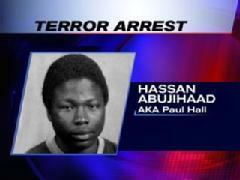 Hassan Abujihaad (original name: Paul R. Hall), arrested for terrorism. Hassan Abujihaad, 28, a convert to Islam (original name: Paul R. Hall) and a former communications specialist for the U.S. Navy, he stands accused of sending e-mail messages to a pro-Taliban Internet site run by Babar Ahmad while serving on the guided-missile destroyer Benfold in the Middle East during 2000-01. As the Los Angeles Times delicately puts it, "Federal agents are trying to determine how Ahmad ended up in possession of detailed and highly classified information about the San Diego-based aircraft carrier battle group that the Benfold was part of, including its classified travel plans and its vulnerability to attack." (Aug. 14, 2004) Mar. 7, 2007 update: Abujihaad was arrested today in Phoenix on charges of spying and providing material support to terrorists. Specifically, he stands accused of providing classified information (about the movement of a U.S. Navy battle group as it traveled from the United States to the Persian Gulf) to Azzam Publications in London as part of a conspiracy to kill U.S. citizens. If convicted of both charges, Abujihaad faces up to 25 years in prison. Comment: I cannot help wondering why it took nearly three years for this charge to turn into an arrest. Mar. 21, 2007 update: Abujihaad was indicted, accused of providing material support to terrorists with intent to kill U.S. citizens and disclosing classified information relating to national defense. If convicted, he faces up to 25 years in prison. Mar. 5, 2008 update: Abujihaad was convicted of providing material support to terrorists and disclosing classified national defense information. He faces up to 25 years in federal prison at his sentencing in May. Apr. 3, 2009 update: Abujihaad was sentenced to ten years in prison. Sadeq Naji Ahmed, 25, an Air Force sergeant. I provide details on him at "Islamists Infiltrate Law Enforcement." (Mar. 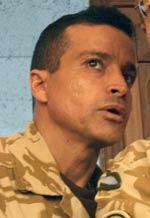 25, 2005) May 18, 2005 update: Testimony at Ahmed's trial has revealed two points: that he wrote in March 2001 that the United States is "the terrorist" and bin Laden "a righteous holy man"; and that, according to his attorney, the Air Force repeatedly promoted and decorated Ahmed, despite his anti-American record . a hidden stash of loaded weapons and ammunition clips, $34,000 in cash, two pictures of Mawlawi shouldering a rocket-propelled grenade launcher, a gruesome videotape of war casualties with Arabic text and voiceover, and more than 20 passports to Morocco, Syria, Iran, and other Middle Eastern countries. Daniel James, corporal in the British army. Daniel James, 44, a corporal in the British army – and so not quite a Pentagon jihadi, but close enough – is accused of passing army secrets to Iran. A fluent speaker of Persian and Dari, the Tehran-born James changed his name in 1997 from Esmail Mohammed Beigi Gamasai to make it Anglo-sounding. A 18-year veteran of the armed forces, he serves as an interpreter for Lieutenant-General David Richards, the commander of 31,000 NATO troops in Afghanistan. The information, sent in coded emails between November 2 and December 18, 2006, concerned the military campaign in Afghanistan; James has been charged under the Official Secrets Act for communicating information "useful to the enemy." His arrest on Dec. 20 followed an intensive investigation to identify the source of the leak. A senior officer said that someone in James' position "would pick up a hell of a lot. He would be able to listen to encrypted phone calls that would be highly sensitive and of course as an interpreter he would be privy to an immense amount of knowledge. He probably knows more than half the senior staff officers." (Dec. 21, 2006) Oct. 28, 2008 update: James's defense at trial is to claim at CIA conspiracy. As reported by the Times: "When arrested on suspicion of spying he told the police he had been 'set up' by the CIA in a plot to undermine General Richards because the Americans were angry that the British commander wanted to find a peaceful solution to the war with the Taleban rather than adopt the US approach of attacking the insurgents." Nov. 6, 2008 update: A British court found James guilty of spying for Iran. One email told Colonel Mohammed Hossein Heydari that forces were setting up a camp on the Iran-Iraq border near al-Amara and added: "Take care of that side." It finished by adding: "Any other work that you may have, I am at your service" and was signed "Esmail the interpreter." On December 16, during a visit to Britain to take some language exams, Cpl James emailed Col Heydari promising him "a very good present." The corporal flew to Amsterdam for the night and Col Heydari emailed back the next day saying: "Thank you for your present." He was arrested later the same day at RAF Brize Norton in Oxfordshire where he was waiting for a flight back to Kabul.